Darkfall New Dawn Quality of Life updates. For the next patch or two, we’ll be continuing our current efforts of making PvE more engaging and driven. 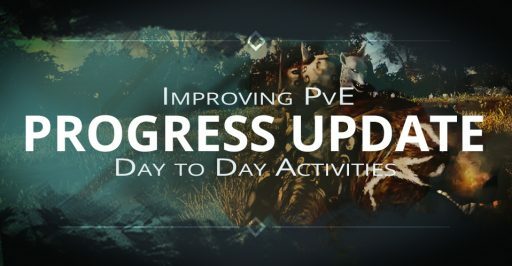 We want to finish and release what we’ve been working on before moving on to more PvP/meta related projects. That’s where the game stands to be benefit the most by having players out there doing things in the open world. We’ve talked about them a while ago as a potential solution to bring the satisfaction of efficiency based scaling within our per player scaling framework. Instead, we’re approaching this as a bonus and extra challenge for those that can really handle high difficulty spawns. We’re still experimenting/testing the best formula, and we may change/tweak this by the time we release it but the current idea is that each kill of a monster part of a spawn “angers” the spawn. For a while, the champions will be the only way to obtain the title consumables, but they may appear as rewards in other content later on. They will come with a max level limitation, like the current skill books, and will allow to progress combat titles only. Another system we’ve wanted to release for a long time is the concept of bindstone quests. Another point this addresses is that for many players, it is still hard to formulate personal goals, or feel accomplished after a play session that doesn’t have a definite end. We also had first hand experience when, as veterans, we would bring newer players to spawns they didn’t know existed because they never needed to go there. This aspect of quests as a drive to explore should provide play session variety to keep things fresh and to discover new monsters.